Tradition now has it that the second weekend in July is when we take my Young Archaeology Club up to Dartmoor. The trip is always regarded with some slight trepidation as it involves around 16 children between the ages of 8 and 11 and all the joys they bring. This year we were staying at the Bellever Youth Hostel which was a bonus as it is nice to be right amongst the woods. It is also a really friendly place and I should imagine when there are not 16 Young Archaeologists staying there, really peaceful and relaxing. The agenda was to reach the hostel at lunchtime on Friday and then spend the afternoon letterboxing on Riddon Ridge. We had three letterboxes of our own to site and the hut circles added some archaeological interest. Saturday morning was to be spent looking around Grimspound followed by an afternoon at Tavistock swimming pool. As my style of swimming is to hit the bottom and run like hell, this gave me a chance to get some decent photographs of the kists and rows around Bellever. It also provided a window to pay a visit to the Plume of Feathers and savour a couple of Newcastle Browns, but best not mention that. Sunday’s schedule was a visit to the Dartmoor Miniature Pony Centre and then return home. Friday morning was wet and wild which did not bode well for letterboxing with a group of kids whose idea of a waterproof jacket consists of a pink shiny garment adorned with fur and emblazoned with the word ‘Barbie’. However, by the time we walked up to Riddon Ridge the sun was shining in all its glory. It did not take long for the air to be filled with the sound of sticks being frantically waggled under rocks. A loud scream soon pierced the air, the heart skipped a beat, had one of the budding ‘Mick Astons’ been introduced to one of our Dartmoor ‘long cripples’ (adder)? No, a whoop of joy indicated that someone had found their first letterbox. The trouble with taking 16 children letterboxing is that it takes about 20 minutes for them to stamp-up as another letterboxer discovered at the next box. Luckily he was a very, very patient man who chatted away to the kids and answered all their questions. Having finally caught a glimpse of Bellever tor, it was time to site the first box which was the ‘Bellever Hobbyhorse‘. The beauty of having a party of little ‘sawn-offs’ was they could get right into the huge gorse bushes to hide the box, yes, slightly sadistic on them and the boxers who subsequently have to retrieve the letterbox. By about 5.00pm we had scoured the ridge, sited the boxes and were praying that the kids wouldn’t find anymore letterboxes as we would be there until nightfall. Wrong, about 500 yards from the road came the sickening ‘clunk’ of stick on plastic. Whilst stamping-up another couple of boxers came along and they were good enough to let the kids have copies of their travellers. By about six o’clock a weary line of children wearily tramped back to the hostel, their little hands as black as a sweeps from the ink pads. Traditionally Friday night is barbeque night and after a quick wash it was back down to the river Dart for dinner. For many years I have been trying to get a photograph of a Dipper but have always ended up with a minute dot or a blur as the bird shot off into the distance. It was therefore with great joy that I noticed a couple of dippers darting up and down the bank. Sadly, by the time the third stone had been tossed into the water they decided to fly off downstream where things were a lot quieter. Everybody enjoyed their meals of burgers and hot dogs and judging by the number of red, spotty bites so did the midges. This was also the first year when all the party returned without anybody going for an accidental ‘dip’ in the water or a spot of bog snorkelling. As the kids supped their drinking chocolate it was time to enjoy one of the many benefits Bellever Youth Hostel provides. That is to sit outside under a star studded sky listening to the creatures of the night. That night was no exception with the sounds of owls, nightjars and a myriad of scurrying animals playing their nocturne. I was still determined to try to get the photograph of a dipper and so by 6.00am the following day I was strolling beside the steaming Dart. Sure enough they were still there but try as I might they just wouldn’t stay still long enough. I must have tramped back and forth along the bank for a good fruitless half hour to the very musical accompaniment of a trilling wren. I also wanted a photograph of the Snailey House so I decided to walk on downstream to get that, maybe there were more dippers further down the river? One of the pleasantest things is to walk along the dewy banks of a river early in the morning and this was no exception. A huge heron suddenly alighted from a tree like an explosion in a mattress factory, obviously took exception to having his breakfast vigil disturbed. A thundering sound came from the ridge above and soon a small herd of ponies and foals came clattering down the hillside. The foals we leaping and sprinting like spring lambs, clearly enjoying the fresh moorland morning. I must admit the area around the Snailey House has grown into a nightmare with head-high gorse bushes lining the path – about time it was sorted as this is a popular walk. Even the ruins of the house have fallen victim to the gorse and is well hidden amongst it. By the time I returned to where the foals were playing they clearly had spent their energy for the morning. One was so fast asleep that I managed to walk right up to it and it was only when the camera clicked that it sprung up and charged off to find mum. Dartmoor Foal taking in the morning rays. By the time I returned to the hostel everybody was tucking into their ‘snap, crackle, and pop’ and slurping mugs of tea. Apparently it was an uneventful night and nobody was missing ‘mam’, well not too much. By now my back was telling me that six foot two does not fit too well into a bunk of about five foot six in length – that is the biggest problem with hostels, maybe that’s why they are called YOUTH hostels. After breakfast we headed off for Grimspound, the children had previously had a lesson on the settlement and were really looking forward to seeing it. One of the junior members of the club had, after learning about the Devil’s connection with the pound designed his own tee-shirt for the day. Lunch was taken in one of the many hut circles and it was amazing how easily 15 children and four adults fitted into it, their sizes are deceptive to say the least. Having feasted on ham sandwiches and fruit the children then went off to Tavistock. This gave me the opportunity to get out onto Lakehead Hill and photograph the many ritual and burial features. It was several years ago when I last visited here and I could not believe how much felling had taken place. I thought it would be no problem to locate the various kists but ended up having to get the map out. 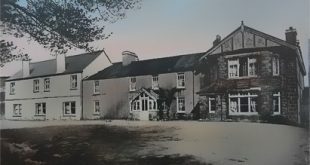 As many people have commented the planting of the Bellever plantation was probably one of the biggest acts of archaeological vandalism that has taken place on Dartmoor. Not only have many features been lost but now the trees are being felled the whole area is an eyesore. In the centre of the picture below you can clearly see the remains of a curved feature which disappears under the tree stumps in the top right. This means that when the trees were originally planted there was a total disregard of any antiquities and today has resulted in the loss of a possible source of information. The picture below shows, what to me is one of the ugliest landscape ‘scars’ possible, its messy, untidy and repulsive and will remain for many years to come. To me the whole of this area has/is being totally mis-managed, for instance many of the Bronze Age features have numbered posts beside them. But nowhere will you be able to get a map which will relate to what the numbers apply or how many there are. You then have unmarked features that although shown on the map remain hidden behind fallen trees. The picture below shows such an example, behind that tree is a small kist and it was only by luck that I happened to spot it. Why on earth does someone not tidy up and also produce a proper guide and walk to the many treasures that are scattered around Lakehead Hill? So all in all I think a very enjoyable weekend was had by all and hopefully the children have been introduced to Dartmoor and its many aspects. Over the two days we discussed archaeology, geography, biology, history and mythology all with a plethora of ‘real’ examples. Oh, by the way, if you are wondering about the blessed teddy bear, his name is Mr T. Bear and he belongs to the school’s early years unit. He has his own passport and has to journey anywhere the school goes and have his photograph taken as proof of his travels – am I getting soft in my old age or what? I did in fact suggest a large granite boulder was attached to his person and a picture taken of his voyage in the river Dart but that met with definite disapproval!